Do you have 6 minutes to spare? Watch our latest video and get a quick introduction to using EndNote! The EndNote Guided Tour outlines basic functionality to help build your EndNote library and cite references into your Microsoft Word documents. Registering your software is easy and useful – we’ll be able to look up your product key if you ever can’t find it. In addition, you’ll be in the loop on the latest software updates and other critical communications about EndNote. Join our product experts and learn about the most commonly used functions in EndNote. We’ll show you how to import PDFs and references from online databases. It will also cover syncing references between EndNote on the desktop & online, to enable you to truly research anywhere! Pose questions to the EndNote community or share your workflow tips with other users. Search EndNote's knowledge base for articles on topics of interest or open a case with Technical Support for further assistance. Using EndNote online in conjunction with EndNote on the desktop will allow you to access the contents of your EndNote library from any computer with an internet connection, sync your references between computers, and share your references with colleagues. With flexible tools for searching, organizing, sharing research, and creating bibliographies, the EndNote for iOS app extends your ability to stay on top of cutting edge research and connect with your EndNote library on the go. 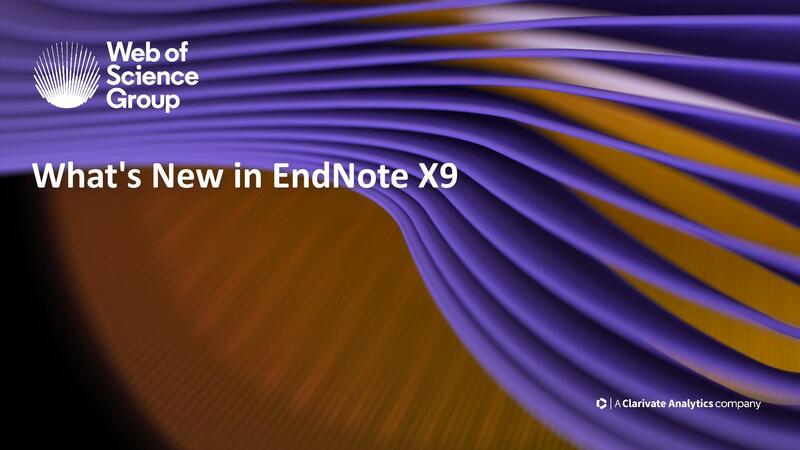 A quick reference for working with EndNote X9. A visual run through of the various menu commands you'll find in EndNote X9 on both macOS & Windows. Have a product question? Search our knowledge base or open a support case with our support teams.